Any religion or institution which involves authority of leaders must have “a proper conservative to this power” (see first quote referenced below) in order to avoid extreme notions of authoritarianism, dogmatism, or fundamentalism. And in Christian religion, given “all have sinned, and come short of the glory of God” (Romans 3:23) we can fully expect that the moment God grants any authority to us, that is the moment God accepts that there will be imperfect exercise of that authority. This should instill in us a humility in our faith, patience and forgiveness for one another’s faults, as well as an openness to additional light and knowledge. As Brigham Young put it: “I do not even believe that there is a single revelation, among the many God has given to the Church, that is perfect in its fullness”. In Mormonism, as we exercise faith in the on-going process of revelation (Article of Faith 9), we can also ask God to help us correct these same revelations using additional light and knowledge to avoid the problems of authoritarianism, dogmatism, or fundamentalism. The following is an on-going collection of quotes from LDS leaders on the topic of authority which highlight this “proper conservative to … power”. The point here isn’t to use circular logic of appealing to LDS authority to settle the discussion on LDS authority, but rather to show that within LDS authority itself, this “proper conservative to … power” is allowed for and advocated. Because of … the apparent imperfections of men on whom God confers authority, the question is sometimes asked,–to what extent is obedience to those who hold the Priesthood required? This is a very important question, and one which should be understood by all Saints. In attempting to answer this question, we would repeat, in short, what we have already written, that willing obedience to the laws of God, administered by the Priesthood, is indispensable to salvation; but we would further add, that a proper conservative to this power exists for the benefit of all, and none are required to tamely and blindly submit to a man because he has a portion of the Priesthood. We have heard men who hold the Priesthood remark, that they would do any thing they were told to do by those who presided over them, [even] if they knew it was wrong: but such obedience as this is worse than folly to us; it is slavery in the extreme; and the man who would thus willingly degrade himself, should not claim a rank among intelligent beings, until he turns from his folly. … Others, in the extreme exercise of their almighty (!) authority, have taught that such obedience was necessary, and that no matter what the Saints were told to do by their Presidents, they should do it without asking any questions.When the Elders of Israel will so far indulge in these extreme notions of obedience, as to teach them to the people, it is generally because they have it in their hearts to do wrong themselves, and wish to pave the way to accomplish that wrong…. . . . . But to return to my question to the Saints, “How are you going to know about the will and commands of heaven?” By the Spirit of revelation; that is the only way you can know. How do I know but what I am doing wrong? How do I know but what we will take a course for our utter ruin? I sometimes say to my brethren, “I have been your dictator for twenty–seven years”—over a quarter of a century I have dictated this people; that ought to be some evidence that my course is onward and upward. But how do you know that I may not yet do wrong? How do you know but I will bring in false doctrine and teach the people lies that they may be damned? Now those men, or those women, who know no more about the power of God, and the influences of the Holy Spirit, than to be led entirely by another person, suspending their own understanding, and rinning their faith upon another’s sleeve, will never be capable of entering into the celestial glory, to be crowned as they anticipate; they will never be capable owf becoming Gods. They cannot rule themselves, to say nothing of ruling others, but they must be dictated to do in every trifle, like a child. They cannot control themselves in the least, but James, Peter, or somebody else must control them. They never can become Gods, nor be crowned as rulers with glory, immortality, and eternal lives. They never can hold scepters of glory, majesty, and power in the Celestial Kingdom. I know that some men . . . have advanced extravagant ideas . . . that the people must go on performing their daily duties without question, and then if the President should do wrong, God would look after him. Such teachings have now and then been heard; but I call your attention to the fact . . . that the Lord has provided means by which the Church can correct every man within it, and can dismiss the unworthy from power. That right is resident in the Church of Christ; and the Church don’t (sic) have to wait till God kills off unworthy servants before a wrong can be righted. At the same time it should be remembered that not every statement made by a Church leader, past or present, necessarily constitutes doctrine. It is commonly understood in the Church that a statement made by one leader on a single occasion often represents a personal, though well-considered, opinion, not meant to be official or binding for the whole Church. The invitation to trust the Lord does not relieve us from the responsibility to know [truth] for ourselves. This is more than an opportunity; it is an obligation…Latter-day Saints are not asked to blindly accept everything they hear. Do not, brethren, put your trust in man though he be a bishop, an apostle, or a president. If you do, they will fail you at some time or place; they will do wrong or seem to, and your support be gone . . . Some may say, ‘Brethren, you who lead the Church, we have all confidence in you, we are not in the least afraid but what everything will go right under your superintendence; all the business matters will be transacted right; and if brother Brigham is satisfied with it, I am.’ I do not wish any Latter-day Saint in this world, nor in heaven, to be satisfied with anything I do, unless the Spirit of the Lord Jesus Christ, the spirit of revelation, makes them satisfied…Suppose that the people were heedless, that they manifested no concern with regard to the things of the kingdom of God, but threw the whole burden upon the leaders of the people, saying, ‘If the brethren who take charge of matters are satisfied, we are,’ this is not pleasing in the sight of the Lord. President Wilford Woodruff is a man of wisdom and experience, and we respect him, but we do not believe his personal views or utterances are revelations from God; and when ‘Thus saith the Lord’, comes from him, the saints investigate it: they do not shut their eyes and take it down like a pill. You cannot accept the books written by the authorities of the Church as standards of doctrine…Every man who writes is responsible, not the Church, for what he writes. If Joseph Fielding Smith writes something that is out of harmony with the revelations, then every member of the Church is duty bound to reject it. We who are General Authorities and general officers are called to teach His general rules. You and we then lead specific lives and must seek the Lord’s guidance regarding specific circumstances. Once again: ‘Notwithstanding those things which are written’—meaning, regardless of what is in print, including the handbooks—’it always has been given to the elders of my church from the beginning, and ever shall be, to conduct all meetings as they are directed and guided by the Holy Spirit’ (D&C 46:2). … we need to develop the capacity to form judgments of our own about the value of ideas, opportunities, or people who may come into our lives. We won’t always have the security of knowing whether a certain idea is ‘Church approved,’ because new ideas just don’t always come along with little tags attached to them saying whether the Church has given them the stamp of approval. Whether in the form of music, books, friends, or opportunities to serve, there is much that is lovely, of good report and praiseworthy, that is not the subject of detailed discussion in Church manuals or courses of instruction. Those who will not risk exposure to experiences that are not obviously related to some Church word or program will, I believe, live less abundant and meaningful lives than the Lord intends. RB: As the world leader of the the Church, how are you in touch with God? Can you explain that for me? GBH: I pray. I pray to Him. Night and morning. I speak with Him. I think He hears my prayers. As He hears the prayers of others. I think He answers them. RB: But more than that, because you’re leader of the Church. Do you have a special connection? GBH: I have a special relationship in terms of the Church as an institution. Yes. GBH: For the entire Church. GBH: Now we don’t need a lot of continuing revelation. We have a great, basic reservoir of revelation. But if a problem arises, as it does occasionally, a vexatious thing with which we have to deal, we go to the Lord in prayer. 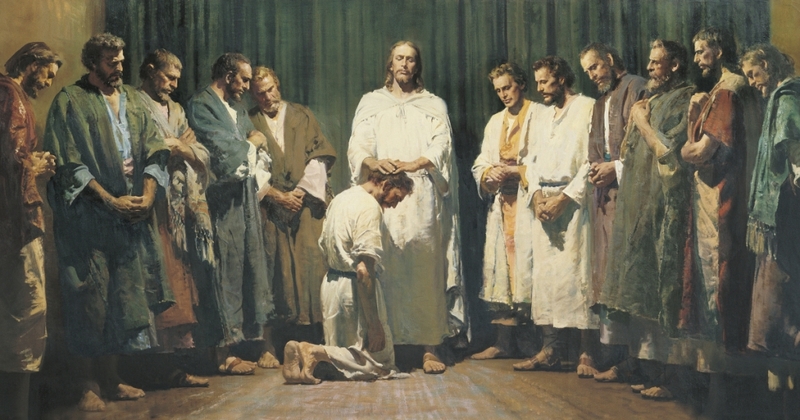 We discuss it as a First Presidency and as a Council of the Twelve Apostles. We pray about it and then comes the whisperings of a still small voice. And we know the direction we should take and we proceed accordingly. RB: And this is a Revelation? GBH: This is a Revelation. RB: How often have you received such revelations? GBH: Oh, I don’t know. I feel satisfied that in some circumstances we’ve had such revelation. It’s a very sacred thing that we don’t like to talk about a lot. A very sacred thing. GBH: I think it’s a real thing. It’s a very real thing. And a special experience. I do not even believe that there is a single revelation, among the many God has given to the Church, that is perfect in its fullness. The revelations of God contain correct doctrine and principles so far as they go; but it is impossible for the poor, weak, low, grovelling, sinful inhabitants of the earth to receive a revelation from the Almighty in all its perfections. It is not the place for any person to correct any person who is superior to them, but ask the Father in the name of Jesus to bind him up from speaking false principles. I have known many times I have preached wrong. Prophets are men and they make mistakes. Sometimes they err in doctrine… Sometimes a prophet gives personal views which are not endorsed and approved by the Lord…. Yes, President Young did teach that Adam was the father of our spirits, and all the related things that the [polygamous] cultists ascribe to him. This, however, is not true. He expressed views that are out of harmony with the gospel. But, be it known, Brigham Young also taught accurately and correctly, the status and position of Adam in the eternal scheme of things. What I am saying is that Brigham Young, contradicted Brigham Young, and the issue becomes one of which Brigham Young we will believe. The answer is we will believe the expressions that accord with the teachings in the Standard Works. That the Lord is in charge does not mean that he inspires or approves everything done in the church. To be perfectly frank, there have been times when members or leaders in the church have simply made mistakes. There may have been things said or done that were not in harmony with our values, principles or doctrine…I suppose the Church would only be perfect if it were run by perfect beings. …be kind regarding human frailty—your own as well as that of those who serve with you in a Church led by volunteer, mortal men and women. Except in the case of His only perfect Begotten Son, imperfect people are all God has ever had to work with. That must be terribly frustrating to Him, but He deals with it. So should we. And when you see imperfection, remember that the limitation is not in the divinity of the work. As one gifted writer has suggested, when the infinite fulness is poured forth, it is not the oil’s fault if there is some loss because finite vessels can’t quite contain it all. Those finite vessels include you and me, so be patient and kind and forgiving. It is not to be thought that every word spoken by the General Authorities is inspired, or that they are moved upon by the Holy Ghost in everything they write. We do not believe in the infallibility of man. When God reveals anything it is truth, and truth is infallible. No President of the Church has claimed infallibility. As a means of coming to truth, people in the Church are encouraged by their leaders to think and find out for themselves. They are encouraged to ponder, to search, to evaluate, and thereby to come to such knowledge of the truth as their own consciences, assisted by the Spirit of God, lead them to discover. … In this manner no one need be deceived. Seventy years ago this Church was organized with six members. We commenced, so to speak, as an infant. We had our prejudices to combat. Our ignorance troubled us in regard to what the Lord intended to do and what He wanted us to do. We advanced to boyhood, and still we undoubtedly made some mistakes, which generally arise from a lack of experience. We understand very well, when we reflect back upon our own lives, that we did many foolish things when we were boys. Yet as we advanced, the experience of the past materially assisted us to avoid such mistakes as we had made in our boyhood. It has been so with the Church. Our errors have generally arisen from a lack of comprehending what the Lord required of us to do. But now we are pretty well along to manhood. When we examine ourselves, however, we discover that we are still not doing exactly as we ought to do, notwithstanding all our experience. We discern that there are things which we fail to do that the Lord expects us to perform, some of which He requires us to do in our boyhood. While we congratulate ourselves in this direction, we certainly ought to feel that we have not yet arrived at perfection. There are many things for us to do yet. The most prominent point of difference in sentiment between the Latter Day Saints & sectarians was, that the latter were all circu[m]scribed by some peculiar creed, which deprived its members the privilege of believing any thing not contained therein; whereas the L. D. Saints had no creed, but are ready to believe all true principles that exist, as they are made manifest from time to time. The creeds set up stakes, & say hitherto shalt thou come, & no further, which I cannot subscribe to. I believe all that God ever revealed, and I never hear of a man being damned for believing too much; but they are damned for unbelief. ‘Do you believe Joseph Smith, Jun., to be a Prophet?’ Yes, and every other man who has the testimony of Jesus. For the testimony of Jesus is the spirit of prophecy. Salvation cannot come without revelation; it is in vain for anyone to minister without it. No man is a minister of Jesus Christ without being a Prophet. No man can be a minister of Jesus Christ except he has the testimony of Jesus; and this is the spirit of prophecy. Whenever salvation has been administered, it has been by testimony. President Joseph Smith read the 14th chapter of Ezekiel — said the Lord had declared by the Prophet, that the people should each one stand for himself, and depend on no man or men in that state of corruption of the Jewish church — that righteous persons could only deliver their own souls — applied it to the present state of the Church of Jesus Christ of Latter-day Saints — said if the people departed from the Lord, they must fall — that they were depending on the Prophet, hence were darkened in their minds, in consequence of neglecting the duties devolving upon themselves . . . This morning I read German and visited with a brother and sister from Michigan, who thought that ‘a prophet is always a prophet;’ but I told them that a prophet was a prophet only when he was acting as such. How easy it would be for your leaders to lead you to destruction, unless you actually know the mind and will of the spirit yourselves. He is a prophet, I am a prophet, you are, and anybody is a prophet who has the testimony of Jesus Christ, for that is the spirit of prophecy. Official statements of the First Presidency that have not been submitted to the membership of the church for its approval are matters of temporary policy only. Under present conditions, for example, the First Presidency may say, ‘We recommend this or that.’ But conditions may subsequently change, and when they do the First Presidency may wish to make a statement which may not be in complete harmony with a former statement. We have to keep our theology up to date by submitting everything that is intended to become a permanent part of the gospel to those whose right and privilege it is to so interpret and then by having it sustained by the people as a definite rule of the church so that all things may be done by common consent. …it is important to remember that I am a General Authority, but that does not make me an authority in general!